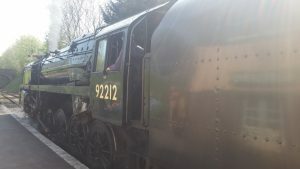 Fifteen riders took part in the 2nd Jim Allen Run, which this year was a guided run from Newlands Corner to the cafe at Alresford Station, on the Watercress Line, then back to Newlands via a different route. The weather was glorious and everyone enjoyed 100 miles of mostly quiet traffic-free back roads, although there were plenty of potholes and gravel patches to dodge. 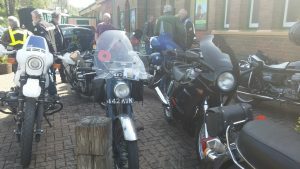 Jim Allen himself made a very welcome appearance at the start on his trusty Triumph Trophy, as he has not been well enough to ride since the 2017 run. Jeff Read’s Big Port AJS had magneto problems at the start, and refused to go. He eventually got the bike going after the rest of us had left, then rode the bike back to his home in West Sussex, changed over to his vintage Norton 18 and rode directly to Alresford, arriving just in time to eat a breakfast bap before the group started off on the return to Newlands. An outstanding effort!